NASA's Chandra X-ray Observatory and the Hubble Space Telescope combine images of a distant quasar powered by a fast-spinning supermassive black hole. For the first time, astronomers have directly measured how fast a black hole spins, clocking its rotation at nearly half the speed of light. The distant supermassive black hole would ordinarily be too faint to measure, but a rare lineup with a massive elliptical galaxy created a natural telescope known as a gravitational lens that allowed scientists to study the faraway object. Just more than 6 billion light-years from Earth, a supermassive black hole powers the quasar . Quasars, the most luminous objects in the universe, shine brightly across vast distances, fed by material that falls into their black holes. Black holes are massive objects whose gravitational pull is so powerful that even light cannot escape their grasp. Most form when a star at the end of its lifetime explodes, its outer core collapsing into a tiny dense ball. Supermassive black holes have masses millions of times that of the sun and are found at the center of most galaxies, including the Milky Way. Their origins are still unknown. The only features scientists are able to measure about the voracious objects are their mass and spin. Astronomers can determine the mass of a black hole by measuring its interactions with gas and other objects, but characterizing its rotation has remained a challenge, especially for more distant supermassive black holes. In the new study, a team led by Rubens Reis of the University of Michigan used NASA's Chandra X-ray Observatory and the European Space Agency's XMM-Newton — the largest X-ray space telescopes currently available — to observe the X-rays generated in the innermost regions of the disk of material circling and feeding the supermassive black hole that powers the quasar J1131. Measuring the radius of the disk allowed the astronomers to calculate the black hole's spin speed, which was almost half the speed of light. The team would have been unable to measure the spin without a rare lineup in space. A giant elliptical galaxy lies between Earth and the quasar J1131. The huge galaxy acts as a gravitational lens to bend and magnify objects that lie behind it — in this case, the supermassive black hole. "It acts like a telescope, but a free one provided by nature," Reynolds said. 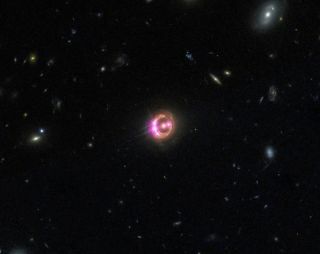 "Such a quadruple lens of a quasar is a very rare object," Guido Risaliti, of the Harvard-Smithsonian Center for Astrophysics, told Space.com in an email. "Until a few years ago, none of them was known." This labeled image shows the different components of the distant quasar known as RX J1131-1231 from Chandra and Hubble. The Chandra data, along with data from ESA's XMM-Newton, were used to directly measure the spin of the supermassive black hole powering this quasar. The spin of a supermassive black hole can reveal information about how it accretes the material it consumes. To achieve a rapid spin, material must fall into the black hole in a direction similar to its rotation, ultimately revving it up like a child spinning a merry-go-round. A slower spin indicates that the gas and dust supplying the black hole fall into it from multiple directions, spinning the black hole up or down depending on whether it comes in with or against the rotation. In this case, the random influx of material acts like a child alternating pushing and pulling the merry-go-round. The quick spin of J1131 indicates that the black hole is being fed by a bountiful supply of gas and dust. These large volumes could be provided by collisions and mergers between galaxies, among other sources, Reynolds said. A slower spin and more haphazard feeding process would be caused by material arriving in spurts, from interstellar gas clouds and stars wandering too close from a variety of directions. "Observational studies over the past 20 years have shown a clear link between the mass of the supermassive black hole at the center of a galaxy and the properties of the galaxy in which it resides," Reynolds said. "These relations suggest a symbiotic relationship between the central black hole and its host galaxy." By studying the black hole, astronomers can learn more about the origin and evolution of galaxies — and spin plays a very important role. "The growth history of a supermassive black hole is encoded in its spin," Reynolds said. "The next immediate step is to obtain a few more black hole spins in the nearby AGN, but it will be difficult to repeat observations like the one of Reis' team due to the rarity of these sources," Risaliti said. "The big step forward will be the measurements of the black hole spins with the next generation of high sensitivity X-ray telescopes, such as the ESA's Athena."